Coffee prepared to taste, freshly ground, for top-quality results in every cup. Delicious milk foam variants – cold, warm or hot, frothy or firm. Two varieties of milk. Two varieties of hot chocolate. And, in parallel, up to 40 litres of hot water/hour for tea lovers. The Melitta® Cafina® XT8 leaves no wish unfulfilled. Melitta® Cafina® XT8 - Enjoyment on a grand scale. Latte Macchiato with soy milk? Whitepresso with white chocolate? If you wish, you can double up and offer two varieties of milk and two varieties of cho- colate. A wide variety of milk foams are available: Cold, warm, hot, frothy and as the crowning topping of the firm Melitta® TopFoam. 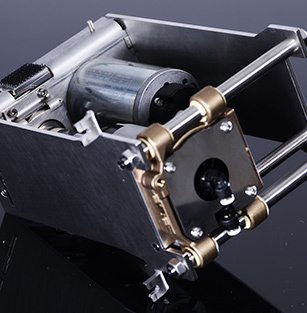 A strong sprinter with excellent stamina: The compact brewing unit (with short travel distances) and fast grinding discs sets up to 250 cups/ hour: Stainless steel provides maximum precision, stability (piston contact pressure can be increased) and a long life. 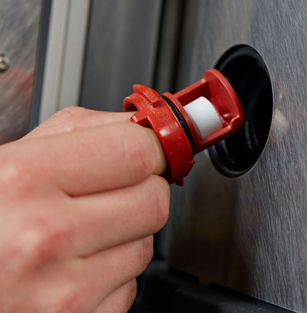 The ACS® control system automatically ensures the same level of quality in every cup. Incredibly simple: "Clean in place" (CIP®). The daily automated cleaning of the milk and brewing system within the self-contained system. There is no need to dismantle the unit. The "HACCP-compliant" seal of approval guarantees the certified hygiene of the Melitta® Cafina® XT8. The stainless-steel brewing unit of the Melitta® Cafina® XT8 has a more compact design and speeds up the brewing process. 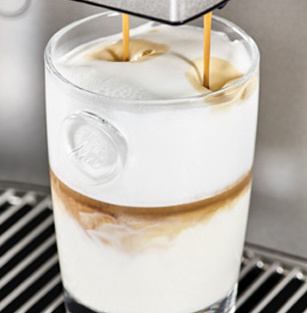 For a particularly intense espresso flavour, the contact pressure of the piston can be increased to up to 1500 N (Variable Pressure System, VPS®). 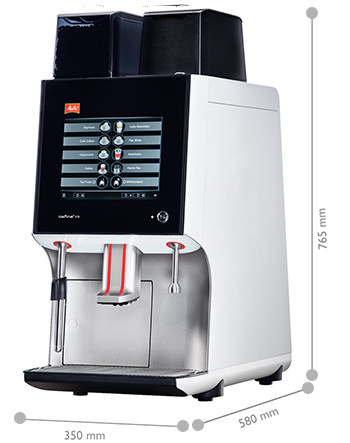 The unique Automatic Coffee Quality System (ACS®) monitors the key parameters during preparation and automatically adjusts them if necessary in order to ensure the same high level of quality in every cup without having to call a technician. The look of the Melitta® Cafina® XT8 underlines the high technical quality and state-of-the-art, and fits in both technically and visually with the familiar modules of the XT range.